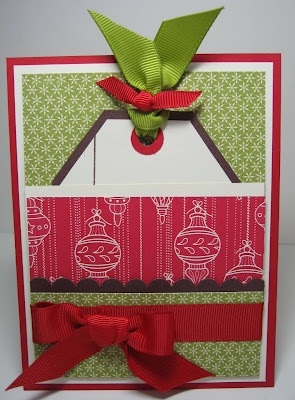 November Stamp Club projects. 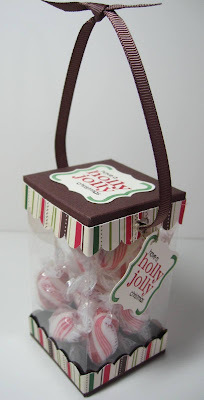 Quick and easy gift giving and packaging. Embossing on tea light candles in a slider box. I followed Lori Tecler's instructions found here. 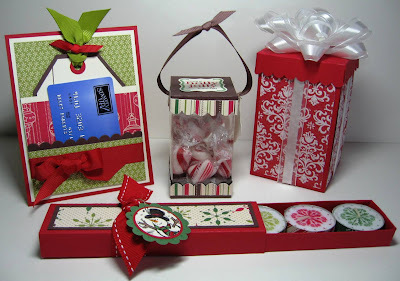 Double pocket gift card holder. Instructions for the red box and ribbon bow in the group photo can be found in the 2009 Edition of the 12 Days of Christmas. I love the tea light candles, but have you burned any of them? How does it do with the tissue paper in it? Loving them! Wish I lived closer! These are great. I wished I lived close and could attend one of your classes - Colorado is a bit of a drive. I love your stuff. Thanks for the inspiration! Wow! These are some amazing projects! Did I already tell you how much I love you? Because I just love coming to your site! What a stunning collection - as always you inspire us mere mortals! WOW woman!! You are constantly sharing super cool projects!! These are great!!!!!!! What a great candle idea. I just found your blog. Your work is wonderful. 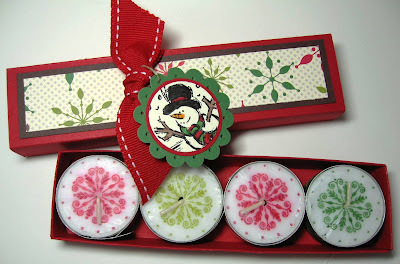 LOVE LOVE the idea of stamping on the tea light candles going to have to make a few of these gift sets up for christmas gifts this year. By the way.....I tried to burn one of these and they don't burn, so you have to let your receipiant know they are just for decoration or to carefully melt the top and remove the decoration before burning.